This article was last updated Aug 11, 2018, but some terms and conditions may have changed or are no longer available. For the most accurate and up to date information please consult the terms and conditions found on the issuer website. The Ink Business Cash℠ Credit Card is a great no-fee card for businesses that spend in typical business categories like office supply stores and internet, cable and phone services, since you will be rewarded with a higher cashback rate in these categories, among others. Compared with other business cards, this card is a standout for the high cashback rate in select categories — all at a $0 annual fee. This card isn’t for businesses that predominantly spend on travel since you will earn a low cash back rate and are better off looking at travel business cards. This card also isn’t for businesses that want a flat-rate for all purchases. (99) Over the Past 60 Days! This card offers a high rate for business spending in select categories, which rivals some competing cards that offer a low flat rate for all spending. Also, the Ink Business Cash℠ Credit Card has a $0 annual fee — unlike most business cards — therefore, saving your business more money. The Ink Business Cash℠ Credit Card doesn’t have any major downfalls, except that it has maximum spending amounts, and this may be an issue if your business is a big spender at office supply stores and on internet, cable and phone services. Other business cards offer no caps, or flat rates on all purchases — but you may have to pay an annual fee or receive a lower rewards rate. Free employee cards: Add employee cards to your account at no additional cost. You can set individual employee spending limits for greater control and earn rewards faster. *Restrictions, limitations and exclusions apply. Benefits are available when you use your card. To get the most value out of the Ink Business Cash℠ Credit Card, be sure to use it for all of your business spending, and take out employee cards as needed (since employee cards earn rewards, too). You can establish individual spending limits for each employee so you monitor their spending. Keep in mind that you, as the account owner, are responsible for all charges made to your account — that means employee spending, too. To earn the signup bonus, make sure you meet the requirements: Earn $500 bonus cash back after you spend $3,000 on purchases in the first 3 months from account opening. This provides a great way to increase your rewards during the first few months of card membership. The Ink Business Cash℠ Credit Card earns you cash back on typical business purchases. Earn 5% cash back on the first $25,000 spent in combined purchases at office supply stores and on internet, cable and phone services each account anniversary year. Earn 2% cash back on the first $25,000 spent in combined purchases at gas stations and restaurants each account anniversary year. Earn 1% cash back on all other card purchases with no limit to the amount you can earn. You can use your points to redeem for cash through an account statement credit or electronic deposit into an eligible checking or savings account, for gift cards or for travel. When you use points to redeem for gift cards and travel, each point is worth $0.01, which means that 100 points equals $1 in redemption value. The signup bonus allows you to earn $500 bonus cash back after you spend $3,000 on purchases in the first 3 months from account opening. 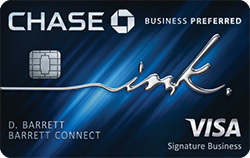 The Ink Business Cash℠ Credit Card and the Ink Business Preferred℠ Credit Card appear to be two similar cards, but they differ in annual fee, rewards and 0% intro period. 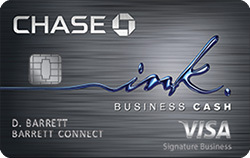 The Ink Business Cash℠ Credit Card has a $0 annual fee while the Ink Business Preferred℠ Credit Card has a $95. The fee may be worth it if your business spends more in the high-earning categories that the Ink Business Preferred℠ Credit Card offers. The Ink Business Preferred℠ Credit Card offers a perk where points are worth 25% more when you redeem for travel through Chase Ultimate Rewards®. This is a great way to increase your rewards and makes the Ink Business Preferred℠ Credit Card the better card for traveling businesses. A key difference is the lack of a 0% intro APR period with the Ink Business Preferred℠ Credit Card. Therefore, if you want to take advantage of an intro interest-free period, the Ink Business Cash℠ Credit Card is a better option which allows you to Earn $500 bonus cash back after you spend $3,000 on purchases in the first 3 months from account opening. Here’s a breakdown of the key features of each card. Rewards Earn 5% cash back on the first $25,000 spent in combined purchases at office supply stores and on internet, cable and phone services each account anniversary year. Earn 2% cash back on the first $25,000 spent in combined purchases at gas stations and restaurants each account anniversary year. Earn 1% cash back on all other card purchases with no limit to the amount you can earn. Earn 3 points per $1 on the first $150,000 spent in combined purchases on travel, shipping purchases, Internet, cable and phone services, advertising purchases made with social media sites and search engines each account anniversary year. Earn 1 point per $1 on all other purchases—with no limit to the amount you can earn. The Ink Business Cash℠ Credit Card is a great card for businesses that spend at office supply stores and on internet, cable and phone services. Not only will you enjoy a higher rate on these purchases than with competing cards, but you will also enjoy a good intro period for new purchases, allowing you to take time to pay off new transactions without accruing interest.